UNITED NATIONS — One year ago the renowned author, playwright, and former President of the Czech Republic Vaclav Havel died at age 75. In tribute to this extraordinary European Renaissance Man, I’m reissuing my column in the spirit of memory and the season. “Havel’s career as literary figure, intellectual and a political dissident, confronted the tyranny of the former communist regime, and oversaw the country’s peaceful transition to democracy and a free market economy. Havel was a man of gravitas and unbending moral authority whose persona was formed by the harsh winds of the Cold War but who was able to turn his classic Bohemian wit to chronicle the ferocious stupidity of the former socialist regime. He paid the price both in harassment, arrest, and the “non-person category” he gained in opposition, especially after the thwarted dreams of the Prague Spring in 1968. His role as a dissident spanned the darkest decades of the old communist regime. In 1977, he and fellow dissidents supported the “Charter 77” human rights manifesto, which emerged as a political template from Central Europe to China today. His works and plays moreover were banned, and he was regularly harassed by the security police. In that epic autumn of 1989, pro-democracy demonstrations jolted the old Soviet order, itself brittle and moribund. A political earthquake rocked Central Europe, the epicenter being in Berlin, but the reverberations ranging from Prague to Bucharest. Without question, Havel’s greatest play became the Velvet Revolution, the political drama the directed and helped choreograph during the tumultuous November. Massive people-power protests which rocked Prague the capital and other centers, finally broke the grip of the ruling communists. Soon after these extraordinary events, in 1993, the Slovak portion of the once-united Czechoslovakia broke off as an independent state. This became known as the Velvet Divorce. Importantly, during Havel’s tenure, the Czech Republic “rejoined history” and regained its place in Central Europe as a strong economy. The country embraced its European roots, and the Czech Republic was admitted into the European Union (EU) and NATO. This presented an almost magical change for a nation who long wished to be part of Western European structures but who was isolated by its “East bloc” status. 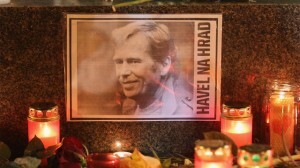 Globally Vaclav Havel was a tireless and unapologetic campaigner for human rights. The Czech Republic has been a proud and vocal sponsor of human rights pressures from Cuba to North Korea. Here at the UN, I had the pleasure of seeing Vaclav Havel during a 2006 human rights symposium on North Korea. “Failure to protect; A Call for the UN Security Council to Act in North Korea,” stressed the need for international action to counter the political repression and humanitarian disaster in North Korea. The former Czech President spoke in favor of dissidents and the dismal political situation in communist North Korea. Shortly after the news of his death, people began lighting candles and placing flowers at the statue of St. Wenceslas on Wenceslas Square, where as a dissident Havel addressed the huge crowds of demonstrators in November 1989. That massive square in the heart of Prague has historically recorded the pulse of the Czech nation. Good King Wenceslas of Bohemia, the medieval martyr and saint of the Czechs, stands guard on his iron steed, watching the ebb and flow of history. Vaclav Havel, the Renaissance Man who made modern history and confronted totalitarian tyranny will be missed well beyond golden Prague.